George L. Clough could best be described as the “Dean” of our 19th C. Auburn and Cayuga County Artists. He was born in Auburn in 1824 and by age 20 had opened a studio there after encouragement from both Randall Palmer and Charles Loring Elliott who were both frequent visitors and sometimes residents of the city. It would have been tough to compete with either Palmer or Elliott but by 1844 Palmer had died in an accident and Elliott was gone to New York so the field was open and he persevered. Clough further developed his skills studying in Europe in the 1850’s. 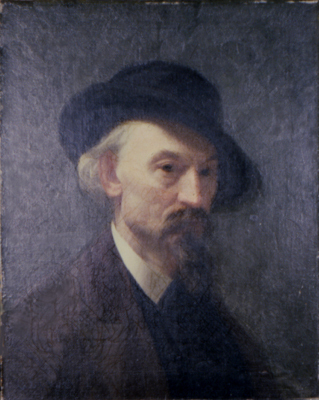 On his return he proved to be a master of landscape painting and spent most of the remainder of his career at that endeavor exhibiting at the National Academy of Design and the Pennsylvania Academy. He became nationally known and recognized for his skills and his work is now in museums and collections across the country. Clough had studios in New York and Brooklyn for thirty years from the 1860’s to the 1890’s but returned to Auburn in 1897. From the late 1840’s and until he moved to New York City he was the most prominent and influential artist of Auburn and Cayuga County teaching and demonstrating the art of the profession to a whole generation of painters who came after him. His style is recognized in the work of William Henry Yates, Harry Sunter, William Bruce, George W. King, C.P. Rising and others. Hundreds of his paintings were on view in and around Auburn and from the similarities in styles and subject matter of his followers it looks like he was their mentor. See Auburn Cayuga Artists. Death of one of Whose Paintings Brought $16,000. One of the best known landscape artists in the United States was George L. Clough, and his works of art adorn the walls of the homes of many of the finest residences in the country. For the past four years he had resided in Auburn, his brush idle through ill health and to which he finally succumbed at 1 o’clock this morning. Death was caused by paralysis. He was born in this city Sept. 18, 1824, and in 1849 married Miss Adeline Peat, sister of Robert Peat of this city. They had two sons, one of whom Charles E. Clough survives and at whose residence No. 15 Cayuga street his father died. At the age of nine years and by the light produced from a pile of burning pine knots, he produced his first work of art. Considering all the conditions it was a wonderful production, and it is now owned by his son. From that time on he developed nature’s gift until his art sales were made in Brooklyn, New York, Buffalo, Chicago, Cleveland and other places including many in Auburn. The highest price paid for any of his paintings was by the Museum of Art in Central Park, New York, where a landscape originally purchased by Mr. Rockefeller at $6,000 was afterward sold to the city of New York for $16,000. Mr. Clough was a man of very retiring disposition, disliked publicity, and the deserving words of compliment which his artistic productions brought to him, while thoroughly appreciated were at the same time embarrassing and excepting for the unsolicited efforts of Mr. Rockefeller of New York and Mr. Duryea of Long Island who assisted him and brought his work before the public, his efforts, perhaps would never have been widely appreciated. He lived for nearly thirty years in New York City where he had a studio and for seven years was president of the Art Club of Brooklyn where his associations with Wadsworth, poet and artist, and others also brought him into prominence. About a half century ago he made a visit to Europe with William Barber and Augustus Seward where he made great progress in the development of his talents. He was also a fine musician, delighted in music and was a fine flutist. Mr. Clough was a man who enjoyed sociability, with his friends, was humorous, kind-hearted and generous to a fault, and those who knew him best will be pained to learn of his demise. Funeral services will be held at his late home, No 15 Cayuga street Friday afternoon at 2:30 o’clock. Remains will be placed in the receiving vault at Fort Hill, until such time as burial can be made in the family lot upon which stands a unique monument, designed by the deceased.